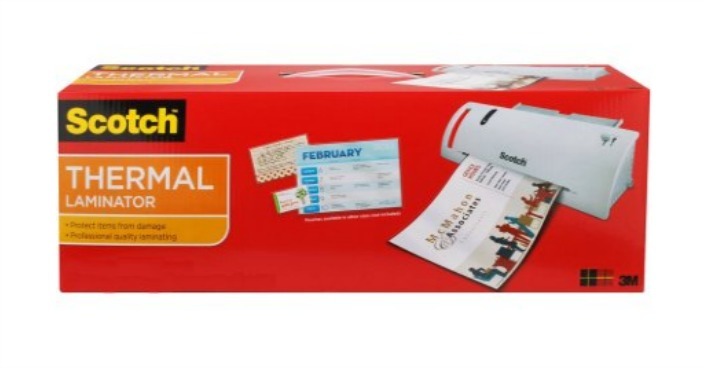 Scotch Thermal Laminator System Just $9.98! Down From $20! You are here: Home / Great Deals / Scotch Thermal Laminator System Just $9.98! Down From $20! Right now you can get this Scotch Thermal Laminator System for just $9.98 (Reg. $20) at Walmart! Enjoy streamlined function from the Scotch Thermal Laminator. It’s a simple and effective way to protect the documents that you handle frequently. This letter-size laminator is a good choice for menus, calendars, templates and much more. The high-quality, crystal-clear finish will give your items a professional look. It’s also suitable for photographs and preserving your favorite images for the long term. Its dual roller system can handle pouches up to 5 mil thick and up to 9″ wide while reducing the occurrence of bubbles and other irregularities. Choose from two temperature settings to suit each and every document. This letter size laminator comes in a starter pack with five starter pouches. Explore the full range of pouch sizes to meet all of your laminating needs (sold separately). y.